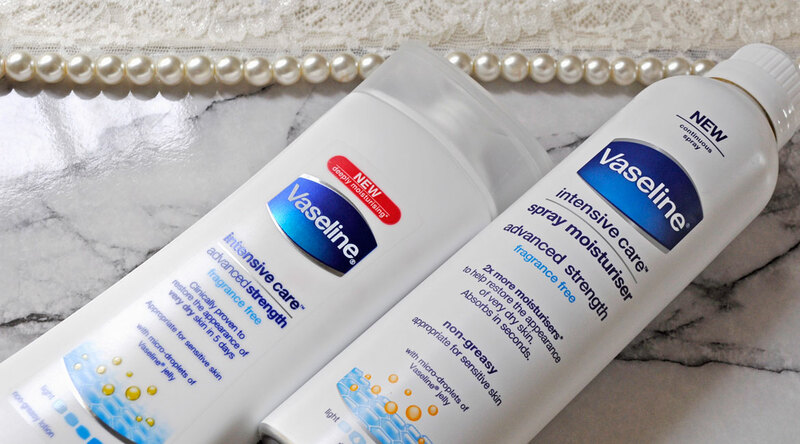 Let me start by saying I have been using Vaseline products for as long as I can remember, the brand has been around for over 140 years and their products are the go-to in my family. Advanced Strength is the latest line in their Intensive Care Range and it couldn’t have come at a better time as winter has left my skin a tad parched. I love the no frills approach to this formula, it is highly effective and super affordable, suitable for all skin types. You can purchase it in a traditional recyclable plastic bottle with a flip top lid, or a handy continuous spray lotion which is perfect for the morning rush and those hard to reach areas on the back. The fragrance free formula feels rich and creamy however its lightweight and fast absorbing. It is infused with micro-droplets of vaseline jelly to deeply moisturise skin and restore its healthy look. It instantly hydrates my skin leaving it smooth and non greasy, perfect for post shower pampering. Gently moisturises extra dry, sensitive skin. Clinically proven to restore the appearance of very dry skin in 5 days. Absorbs in seconds to help restore the appearance of very dry skin. 140 years, wow they must be doing something right. I’m definitely a fan of vaseline! They used to make one for baby’s that had a really great baby powder scent…I wonder if they still have it. Thanks for sharing! I love it too, it is both affordable and effective!